The most popular places to buy US property in Q1 this year have just been mapped. A recent study finds that numerous locations in the country come out well above the national average for buying US property. Counties and metro areas in Florida rank particularly well with several places at the top of the rankings. ATTOM Data Solutions have just released their Q1 Pre-Mover Housing Index. The survey for the first three months of the year pinpoints the most popular locations to buy US property based on loan application data. Using the number of pre-movers applying for a mortgage, the Index rates metro areas and counties in order of popularity for relocation. The data also shows favourite places for second homes in the US. Using figures from the historic average of the Pre-Mover Housing Index, in existence since 2004, the latest study shows the likelihood of a property being sold within 30 days of the mortgage applications. 62.2% of US property with a ‘pre-mover flag’ sell within a month of the loan settlement date. In the first three months of this year, among the 120 metro areas covered, the most popular places to buy US property were mostly in the central and south of the country. The overall favourite was Colorado Springs with a total pre-mover index of 251, well ahead of the national average of 100. Charleston in South Carolina and Raleigh in North Carolina came in second and third place respectively. Closing the top four locations was Tampa with a score of 109. With a strong economy and buoyant employment creation, Florida has consistently ranked as one of the hotspots to buy US property over the last few years. Within the Sunshine State, Tampa regularly tops the ratings. The metro area was recently declared the US location with the healthiest property market. Tampa, a metro area that combines quality of life, good job opportunities and property below peak prices, has increased in popularity over the last year. In the ATTOM Data Solutions Index, Tampa shows the highest year-on-year change in the country for pre-movers. The rise of 41% is easily the highest among the top rankings. Tampa property also has the lowest price tag of the top five in the Pre-Mover Index. The average pre-mover price in the metro area was US$229,511. The data appears to confirm the tendency among relocators to head for areas in the US with lower property prices. 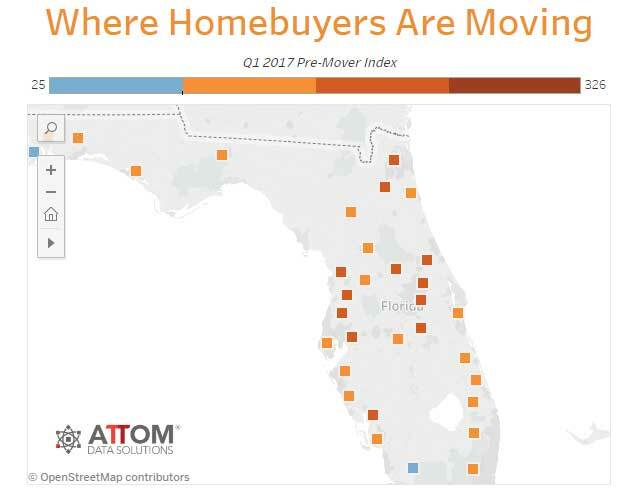 “Home buyers in 2017 are more likely to be moving to markets — or moving up within markets — that still have relatively affordable housing inventory along with access to jobs,” said Daren Blomquist, Senior Vice President at ATTOM Data Solutions. As well as a study of metro areas, the Index also examines the performance of pre-movers in 120 US counties. The countrywide map shows high activity in several areas including east Texas, the east coast generally and in Florida. A more detailed look at the Florida counties included in the Index reveals some of the busiest buying activity in the country. Hillsborough and Pasco counties, that both include the Tampa Bay metro area, rank among the top favourites to buy US property. Hillsborough has the highest rate in Florida with 243, well over double the national average. Pasco comes in at a slightly lower 220. The graphic below highlights the hotspots in red and orange while counties with less buyer activity feature in blue. Florida has a clear predominance of strong pre-mover activity. Other Florida pre-mover hotspots include the counties around Orlando, Osceola, Orange and Lake. Duval, the county that incorporates Jacksonville, ranks highly with a total score of 225. Charlotte County in Southwest Florida and home to popular residential areas such as Englewood, also features high on the list with a pre-mover ranking of 181. Another part of the Index looks at the popular places to buy US property as holiday homes. In this ranking, Florida metro areas dominate and take three out of the top four positions. Naples is the most popular place for second home purchases with Cape Coral in second position and Sarasota in fourth. Between the three of them, these Florida metro areas account for over 63% of the total market share of the pre-mover second home market.